A House of Assembly aspirant, Alh. Abdulsalami S. Aliyu, was denied entrance into the venue of the primary election held yesterday in Okehi local government secretariat, Kogi State. Why was a man who bought the forms locked out? Alhaji Abdulsalami S. Aliyu popularly known as De Nation was successfully screened last week at the Haleems hotel in Lokoja to contest for the position of House of Assembly Okehi Constituency, Kogi State on the platform of the APC. 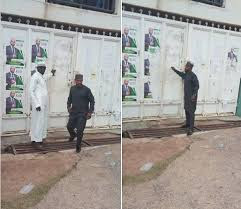 His aide shared pictures of him locked out of the secretariat as he tried to gain access into the venue all to no avail.